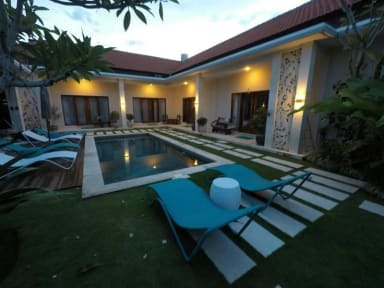 WaterBorn Bali combines the social hostel atmosphere, with luxury villa living. You can chill on the grass or on sunbeds in our beautiful garden, or you can go up to sun deck to relax. Our crystal clear swimming pool is waiting for you to jump in day/night. There is a common area with TV & DVDs, and various card/board games. All rooms have high quality matresses, hot water, A/C, and Wi-Fi connection. The rooms are cleaned daily, common bathrooms are cleaned a few times a day. Every room has wardrobe with lock, dorm room has big size lockers. We are located right in the center of Batu Bolong, Canggu; yet in a quiet area. Many cafes and bars are just a few minutes of walking distance away, such as Deus, Pretty Poison, Crate and Betelnut. Batu Bolong and Echo Beaches are only 2 minutes on motorbike. We also have free private parking in front of our hostel. A delicious big breakfast is served every morning, and you can have it anytime you want, even in the late afternoon. Drinking water, coffee and tea are free, beer and soft drinks are available. Amazing hostel with a great price tag. I think this is one of the best hostels I stayed at, very clean and lovely staff. You also get free breakfast ( a selection of omelette and pancakes). The hostel is calm in comparison to other hostel, so you do get great sleep. I love the swimming pool, the vibe is so chill and there are 3 cats that are so cute and friendly! LOVE THIS PLACE, extended for an extra night and sad I didn't find it sooner. Nice pool, nice room, decent breakfast, great location. There was table tennis and other games and just a chilled vibe! We loved our time at Waterborn! The girls are really sweet and helpful. The free breakfast they cook in the morning is a great touch! The rooms are so clean - they go in during your stay to keep it nice for you if you want. The room is big with a big bed, wardrobe, desk & mirror. The aircon is amazing! The shared bathroom was huge too! The pool & loungers were nice! Very chilled atmosphere, but close to loads of great shops, cafes & restaurants! Would definitely recommend Waterborn! Best hostel in paradise, with a pool and deck chairs to enjoy the Bali sunshine. Love that the dorm has single beds instead of bunks, and the breakfast every morning is pretty filling. Good place to socialise, and if you want a quick bite Warung Bu Mi is just round the corner. Ali is a great host and definitely one to hang out with when you're out partying in Canggu. Many thanks to Kadek and co too for making the stay memorable, as well as the little kitties :) Highly recommended. Cool place, with clean design, and friendly staff. I spent a 4 nights here and would have been happy to stay for a month. The hostel was a small one but all the rooms and bathrooms were spacious and clean. 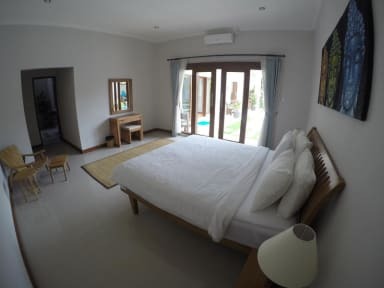 Very good location right in the heart of Canggu. Fabulous breakfast! The hostel is mainly private rooms with a six bed dorm. I stayed in the dorm and a nice feature is that the beds are all normal twin beds, not bunks. The place is very clean and the pool and common area are well kept. The staff are all friendly and do a great job. Socially was pretty quiet when I was there, people seemed to keep to themselves and didn’t have a party vibe. Great place for chilling! Not a party hostel but staff are very friendly and welcoming. Breakfast was included which was nice. Pool area is also very nice. Lovely hostel - not the cheapest but large room with very comfy beds. Very clean. Good breakfast too.